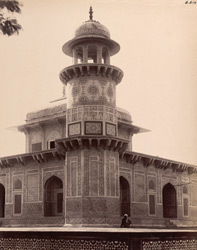 Photograph of the minaret of Itimad-ud-daulah's Tomb at Agra, taken by Edmund William Smith in 1893-4, from the Archaeological Survey of India. The mausoleum was built c.1625 by Noor Jehan, the favorite wife of the Mughal Emperor Jehangir (r.1605-27) in memory of her father Ghayas-ud-din (Itimad-ud-Daulah), and contains both his and his wife's grave. The Mausoleum, a white marble rectangular building, stands in a garden on a stone platform situated on the banks of the river Jumna. The delicately carved marble screens let in light and air, and these, together with the inlaid pietra dura work on the walls and floors, make this a most beautiful building. Smith wrote in Moghul Colour Decoration of Agra, 1901, "On the four corners of the tomb...are turrets containing staircases leading from the ground floor of the mausoleum to the cenotaph chamber on the first floor. In keeping with the rest of the structure they are laid from top to bottom with various geometrical and floral designs in marble mosaic and valuable stones...The bottoms of the turrets at the four corners of the building are polygonal in shape, but the upper parts are cylindrical, and are surmounted by cupolas. The designs on the lower and middle portions are chiefly composed of geometrical patterns,whilst those upon the upper parts are made up of conventionalized foliage...the sides of which are panelled and inlaid with vases, cups, cypresses, &c."